This article is part 11 of a series of articles featuring the ODI Working Paper Exploring the science of complexity: Ideas and implications for development and humanitarian efforts. Complexity sciences look at the phenomena that arise in systems of interconnected and interdependent elements and multiple dimensions (Concept 1). Both positive and negative feedback processes take place (Concept 2), acting to dampen or amplify change; emergent properties (Concept 3) result from the interactions of the elements, but these are not properties of the individual elements themselves. These first three concepts help to clarify aspects of systems that are complex, drawing on applications from social, economic and political life. These are features by which complexity in a given system can be recognised. Feedback, as illustrated in the quote above, is at the heart of phrases such as ‘vicious circles’ or ‘selffulfilling prophecies’ and, in this broad sense, can be described as an influence or message that conveys information about the outcome of a process or activity back to its source2. At its most basic, feedback can be amplifying, or positive, such that a change in a particular direction or of a particular kind leads to reinforcing pressures which lead to escalating change in the system3 4. Feedback can also be damping, or negative, such that the change triggers forces that counteract the initial change and return the system to the starting position, thereby tending to decrease deviation in the system. Although feedback plays out in very distinctive ways in complex systems, the basic principles are the same as in simpler systems. The major differences relate to how feedback is treated – in simpler systems, feedback may be linear, predictable and consistent. In complex systems, as Byrne suggests5, feedback is about the consequences of nonlinear, random change over time. In simple systems, the dynamics and information flows around the system are referred to as feedback loops. 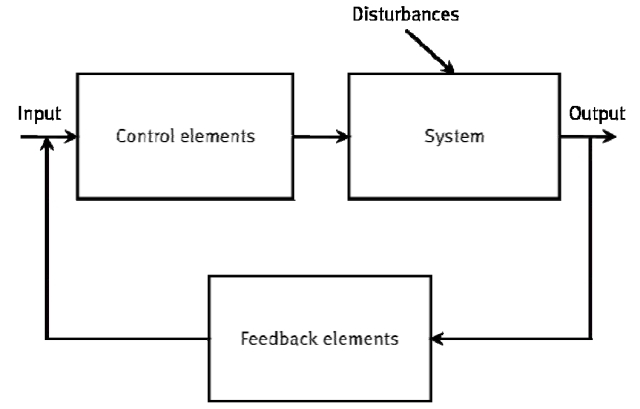 This is usually represented mechanically, as shown in the typical example of a feedback system in Figure 1 below. Input into a system results in an output which feeds back into the system again, potentially adjusting the inputs. Figure 1. Example of a feedback system (source: Schueler and Schueler6). 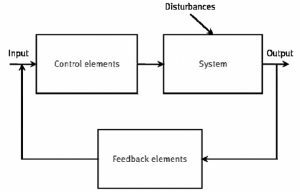 In such systems, where outputs are predictable and determined, feedback is often associated with controlling the system. A common metaphor is of a bath filling up7, in which both the taps and the plug enable feedback to control the system. Another common example is of a heater and a thermostat. 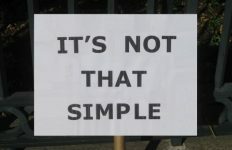 Although feedback in complex systems is distinct from that in more simple systems, the basic principles are the same. Simply put, feedback can be amplifying, or positive, such that a change in a particular direction or of a particular kind leads to reinforcing pressures which lead to escalating change in the system8 9. Feedback can also be damping, or negative, such that the change triggers forces that counteract the initial change and return the system to the starting position, thereby tending to decrease deviation in the system. Negative feedback is associated with the concept of homeostasis, which will be addressed in Concept 10. Mittleton-Kelly10 provides a useful qualification by suggesting that it is feedback processes, rather than feedback loops, that are to be found in complex systems. For example, like any complex system, the Earth’s climate has many feedback processes. Some of these amplify and reinforce an underlying trend and so destabilise the climate, moving it in new directions. Other feedbacks are fundamentally stabilising, in that they counteract the original change and return the climate to equilibrium. Scientists do not understand many of the principal feedbacks in the Earth’s climate but are most concerned with the positive feedback that could drive climate to a higher temperature or even produce a runaway greenhouse effect. Events in the Arctic show how this could happen – open water left by the Arctic ice melting is much darker and absorbs about 80% more solar energy than ice, which makes the waters warmer, melting ice and leading to more ‘dark’ water – this could change the energy balance of the entire Northern hemisphere. Simultaneously, northern boreal forests will die as the Arctic warms, releasing more carbon into the atmosphere. And the 2,500 cubic kilometres of peat under the tundra of Siberia, Alaska and Canada would release vast amounts of methane into the atmosphere. Climate scientists have also identified some counterbalancing negative feedback processes – the newly melted Arctic may absorb more carbon dioxide. There is fierce debate about the relative influence of positive and negative feedbacks, but in recent years the evidence is mounting that dangerous positive feedbacks are outweighing negative ones11. Work on the international food system has highlighted that feedback may also be masked or disregarded12. Because of the distances between the use of resources and the environmental consequences – both in times of geography and time – feedback signals are not perceived or are difficult to correlate to consumer choices and management practices. Such feedback might occur at a scale where the information cannot be detected or transferred – masked feedback – or is not acted upon despite the fact that it is perceived (disregarded feedback). Feedback relationships that are not functioning properly can have serious implications for the food system and life-supporting ecosystems. While unmasking masked feedback is often a question of deepening the understanding of ecosystem functioning through scale-relevant monitoring and institutions, coping with disregarded feedback is a matter of enhanced communication between actors in the food system. In such a system, changes in the elements and dimensions mutually feed back to each other in a continually dynamic manner14. Any change in a particular element or dimension has an influence on others in the system, causing further changes around the system15. 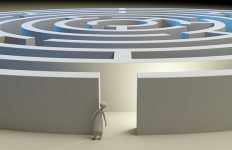 In more complex systems, several interacting feedback processes mean that changes in some directions are amplified while changes in other directions are suppressed (other distinctions made between complexity science and systems thinking, some of which were outlined in Box 1 … [in part 7 of this series]). UK political engagement with the complex factors behind the EU illustrates aspects of feedback in public debates20. In the build-up to the 2001 election, the New Labour agenda was to create positive feedback around the Euro issue leading to change, whereas the more sceptical Conservative party attempted to reinforce negative feedback, inhibiting change. Specifically, a number of key variables were identified by both sides, and the relationship between them was highlighted in order to support their separate arguments (see Figure 2). At the same time as trying to maintain their preferred set of relationships in the minds of the public, the parties had to deal with wider issues such as the movement of the Euro on currency markets and public reactions in other countries. Figure 2 illustrates how the debate on the Conservative side created a set of assumptions that were geared towards minimising change (the left-hand side of the figure), whereas New Labour was working towards amplifying change (the right-hand side). Figure 2. Key variables and relationships between them in the Euro debate (source: Haynes21). 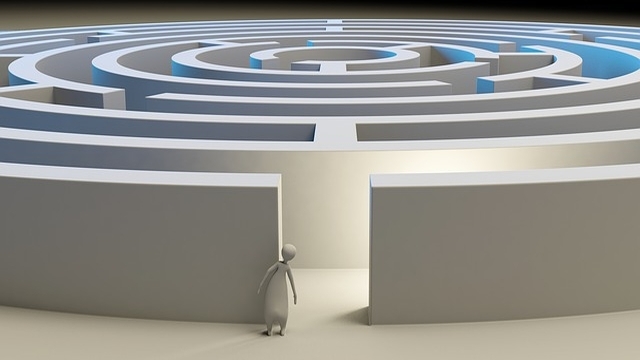 The complexity and combination of these feedback processes highlight the dynamic interaction of multiple issues, which made it hard to disentangle one issue from the other, creating unpredictability in the overall circumstances. In order to better understand how feedback plays out in the international aid system, it is important to pay careful attention to areas where change has not happened despite continual pressure, and to areas where there has been considerable change. It is useful to assess how negative and positive feedback plays out over time in the context of the relationships embedded in the international development system between the various communities, institutions, countries, etc. There is also feedback that plays out between different dimensions of the development, and between different dimensions and specific elements. Incorporating feedback can have dramatic effects on models of complex systems. For example, the Stern Review highlights that the cost of climate change over the next two centuries will be equivalent to a loss of at least 5% of global per capita consumption in perpetuity. However, scientific evidence has highlighted a number of important feedback loops, whereby rising temperatures could lead to further increases in greenhouse gases through the release of carbon dioxide from soils and methane from permafrost, thereby boosting the global temperature response to greenhouse gas emissions. When Stern’s analysis incorporates these known feedback loops, the total average cost rises from 5% to 14.4% of global per capita consumption22. In complex systems, positive feedback can make deviations grow in a runaway, explosive manner, leading to accelerating changes and potentially a radically different configuration for the system23. The notion of feedback can help to better understand an increasing range of phenomena being faced by international agencies. For example, beyond its economic effects, climate change is also seen as contributing to the rise in disasters. Much of this thinking suggests that disasters are discrete phenomena that are external to the social or environmental systems upon which they impinge. According to this approach, disasters and society are related to one another in a linear, cause and effect manner. However, in reality, growing population, migration of population to coasts and to cities, increased economic and technological interdependence, and increased environmental degradation are just a few of the factors that feedback into each other and underlie the increase in disasters24 25. Feedback suggests that there is a different way to view disasters: not as isolated phenomena, but as the result of escalating positive feedback within or between complex, dynamic systems. In many parts of any economy, there are positive feedback processes at play, which magnify the effect of small economic shifts. Once economic forces select a particular path, they may become locked in, regardless of the advantages of other paths. If one product or nation in a competitive marketplace gets ahead, it tends to stay ahead and even increase its lead. This concept, known to economists as path dependence, will be explored in more depth later, in Concept 5. By contrast, Arthur’s work27 on feedback and economics argues that conventional economic theory – with its focus on diminishing returns – overemphasises negative feedback. Specifically, economic actions eventually lead to negative feedback loops which, in turn, lead to a predictable equilibrium for prices and market shares. According to conventional theory, the equilibrium marks the ‘best’ outcome possible under the circumstances: the most efficient use and allocation of resources. Negative feedback in this sense tends to stabilise the economy, because any major changes will be offset by the very reactions they generate. In order to illustrate the implications of positive and negative feedback in the aid world, it is worth drawing on the work of a leading analyst [Killick]28 who suggests that there have been major movements in almost all dimensions of British aid policies to Africa in the past four decades. To cite a few examples, the department responsible has shrunk and grown, there have been changes in the influence of commercial motives, there have been changes in the real value of aid, there have been changes owing to lessons learned, there have been changes away from growth towards poverty reduction, and so on. Importantly, Killick also suggests that it is ‘almost inevitable’ that changes at ground level have been less dramatic than those at head office and policy levels. Applying the concept of feedback would imply that the feedback processes at the head office and policy level are more likely to be amplifying and more change-enabling than those surrounding the work of agencies in developing countries, where there may be some degree of homeostasis and where negative feedback processes that inhibit change may prevail. Moreover, the international aid system may be characterised by both masked and disregarded feedback. The sheer size and scope of the system, and the loose coupling that occurs between the different elements, may mask many aspects of the system. Furthermore, the political dimensions within which aid is embedded may also lead to disregarding feedback as to the actual effects of aid. An approach for furthering such understanding, Drivers of Change, has been developed within DFID29. This approach was motivated by the fact that donor organisations frequently explained away the failure of their programmes by pointing to a lack of political will for change among aid recipients, without examining the underlying reasons for this lack of the will. Drivers of Change was developed as a learning exercise to enable a better appreciation of the interlocking causes that make progressive change so difficult in some of the poorest developing countries. This includes assessments of the ways in which the efforts of donor organisations can become part of the problem rather than a source of solutions. The exercise enables an approach to aid policy that focuses on how the complex interaction between economic, social and political factors can variously enable and inhibit change.